1. 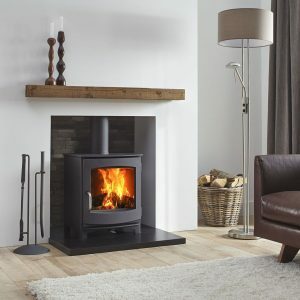 Does the 5kW stove have reasonable size door opening and firebox (internal area where logs sit) so you can fit reasonably-sized logs in? Don’t worry about this too much but bear it in mind. Five small logs actually burner hotter and catch more easily than two large logs so it is good practice chopping small logs. 2. Does the wood burning stove have adjustable legs or feet to prevent the stove rocking, this breaking any fire cement seal at the collar? A good feature if the hearth is uneven but not a deal-breaker with a smooth hearth. 3. Is the 5kW stove Ecodesign approved (SIA Ecodesign approved same thing)? Stoves sold after 2022 will have to be so. 4. Do you have a tight chimney or do you want to lessen the risk that a liner might not go down? 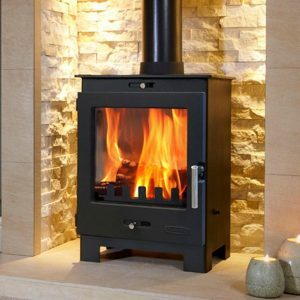 DEFRA Exempt wood burning stoves with a 5″ collar can often be fitted to a five inch liner rather than the usual 6″ minimum should this be required? I seriously suggest any self installer thinks about this one! 5. 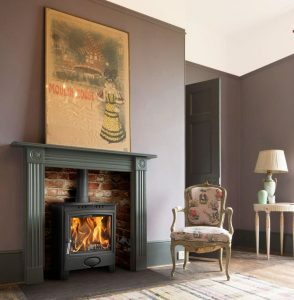 Can you can talk to somebody on the phone should you need to after the wood burning stove has been delivered, especially if you are self installing? Will the staff at “wesellzillionsofstoves.com” be able to assist with any installation issues? 6. What is the MAXIMUM output in kW of your 5kW stove? The majority of manufacturers just specify the “NOMINAL OUTPUT” and this figure means very little in real life. The NOMINAL is a figure the manufacturer chooses to sell the stove atand that the stove is capable of reaching at least this output with one fuel load. But it is not the maximum. Check out the size of the area where the logs will go (firebox size) as this varies enormously. The kW output is completely dependant on the amount of logs burning. If you can fit three logs in stove A and just two logs in stove B then stove A will be capable of throwing out 33% more heat. 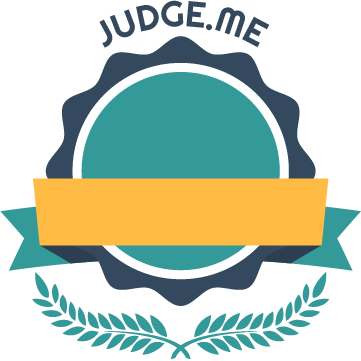 DO NOT TRUST MANUFACTURERS’ kW RATINGS as manufacturer’s specify what output they desire and testing allows for much “playing with the figures”. This is why you can get small 5kW stoves (e.g. Aga Little Wenlock) and large 5kW stoves (e.g. DG Ivar which is actually rated 5kW but larger firebox than the Aga Little Wenlock). A Little Wenlock might get to 5kW and not be capable of any higher whilst a DG Ivar, despite being rated at 5kW, can get to 8kW with a little extra fuel. 7. Will your 5kW wood burning stove require an air vent within the room (some walls are very difficult to drill)? 5kW or under and wood burning stoves often do not require an air vent (new builds always require an air vent). 8. Will your wood burning stove fit in your recess WITH the required air gaps around it? 9. Are you in a Smoke Control Area? Choose your stove accordingly (DEFRA exempt if you wish to burn wood!). 10. What is the stoves’s efficiency? If a stove has an efficiency rating of 70% then 30% of the heat from your logs goes up the chimney. If a stove has an efficiency rating of 90% then only 10% goes up the chimney. So think of this in terms of how many logs you have to chop/buy. A tall chimney (6m or more) that is lined will be happy with an efficient stove. But beware… if you are not fitting a liner or if you have a short chimney (less draw from a shorter or unlined chimney) then you might desire a little more heat going up your chimney because more heat means more draw. If your chimney is short or unlined then one of the older less efficient designs may perform better. But please DO line your chimney if you can:-) Efficiency importance is overrated in my humble opinion. 11. If you are buying a DEFRA Exempt 5kW stove do not buy cheap without understanding that you might have a problem with a poor quality stove: DEFRA Exempt stoves are designed so they cannot be fully shut down (to prevent slumbering which causes incomplete combustion and this is polluting). I have fitted a few cheap Internet stoves and could not stop the bloody things firing on all cylinders. In one situation I removed the DEFRA kit (not in a smoke control area) which was of poor quality and it then worked perfectly and the other – the lady who purchased it returned it and we fitted an Ekol which performed beautifully. Open and close the door on a cheap Chinese stove. Then open and close the door on a DG, Arada, Aarrow, Woodford, Charnwood or Parkray stove. You’ll understand the difference. Stove pricing reminds me of wine pricing. A £20 bottle of wine is not double the quality of a £10 bottle of wine (the drinking experience might be improved by 20% as an example). We are talking “the law of diminishing returns here. They are all “fire in a metal box” at the end of the day. 13. 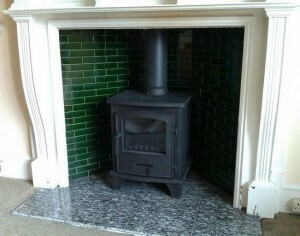 Many modern stoves can go on 12mm hearths. Others require full, 5″ thick constructional hearths.